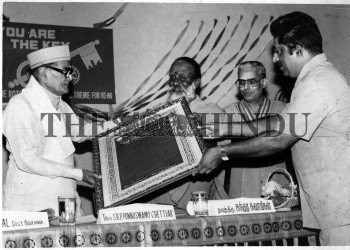 Caption : Sri Sundara Swamigal, Head of Gowmara Mutt being given the `For the Sake of Honour Award' by the Rotary Club of Coimbatore Mid Town in the textile city of Coimbatore in the southern Indian State of Tamil Nadu during April 1986. Mr. S.R.P.Ponnusamy Chettiar, former MLC (with cap) is giving away the award. Mr. C.V.Mohanasundaram, president and Mr. R.Kannusamy, secretary of the club are looking on.